I've written volumes on the havoc stress can wreak on one's physical and mental health (such as the Yale study, which found that prolonged stress causes degeneration in the area of the brain responsible for self-control). The tricky thing about stress is that it's an absolutely necessary emotion. Our brains are wired such that it's difficult to take action until we feel at least some level of this emotional state. 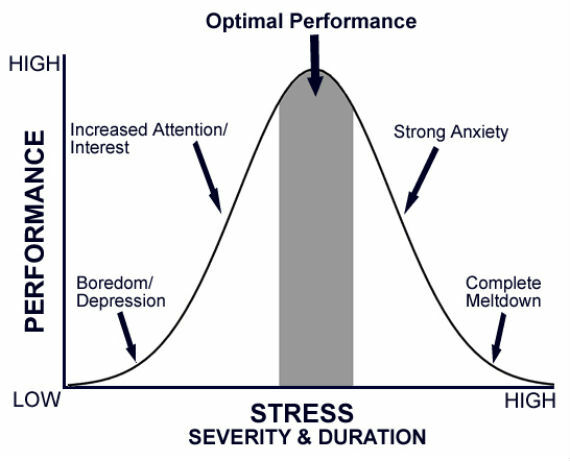 In fact, performance peaks under the heightened activation that comes with moderate levels of stress. As long as the stress isn't prolonged, it's harmless. Research from the University of California, Berkeley, reveals an upside to experiencing moderate levels of stress. But it also reinforces how important it is to keep stress under control. The study, led by post-doctoral fellow Elizabeth Kirby, found that the onset of stress entices the brain into growing new cells responsible for improved memory. However, this effect is only seen when stress is intermittent. As soon as the stress continues beyond a few moments into a prolonged state, it suppresses the brain's ability to develop new cells. "I think intermittent stressful events are probably what keeps the brain more alert, and you perform better when you are alert," Kirby says. For animals, intermittent stress is the bulk of what they experience, in the form of physical threats in their immediate environment. Long ago, this was also the case for humans. As the human brain evolved and increased in complexity, we've developed the ability to worry and perseverate on events, which creates frequent experiences of prolonged stress. Besides increasing your risk of heart disease, depression, and obesity, stress decreases your cognitive performance. Fortunately, though, unless a lion is chasing you, the bulk of your stress is subjective and under your control. Top performers have well-honed coping strategies that they employ under stressful circumstances. This lowers their stress levels regardless of what's happening in their environment, ensuring that the stress they experience is intermittent and not prolonged. While I've run across numerous effective strategies that you can employ when faced with stress, what follows are some of the best. Some of these strategies may seem obvious, but the real challenge lies in recognizing when you need to use them and having the wherewithal to actually do so in spite of your stress. Taking time to contemplate what you're grateful for isn't merely the "right" thing to do. It also improves your mood, because it reduces the stress hormone cortisol by 23 percent. Research conducted at the University of California, Davis found that people who worked daily to cultivate an attitude of gratitude experienced improved mood, energy, and physical well-being. It's likely that lower levels of cortisol played a major role in this. Positive thoughts help make stress intermittent by focusing your brain's attention onto something that is completely stress-free. You have to give your wandering brain a little help by consciously selecting something positive to think about. Any positive thought will do to refocus your attention. When things are going well, and your mood is good, this is relatively easy. When things are going poorly, and your mind is flooded with negative thoughts, this can be a challenge. In these moments, think about your day and identify one positive thing that happened, no matter how small. If you can't think of something from the current day, reflect on the previous day or even the previous week. Or perhaps you're looking forward to an exciting event that you can focus your attention on. The point here is that you must have something positive that you're ready to shift your attention to when your thoughts turn negative. Given the importance of keeping stress intermittent, it's easy to see how taking regular time off the grid can help keep your stress under control. When you make yourself available to your work 24/7, you expose yourself to a constant barrage of stressors. Forcing yourself offline and even -- gulp! -- turning off your phone gives your body a break from a constant source of stress. Studies have shown that something as simple as an email break can lower stress levels. Technology enables constant communication and the expectation that you should be available 24/7. It is extremely difficult to enjoy a stress-free moment outside of work when an email that will change your train of thought and get you thinking (read: stressing) about work can drop onto your phone at any moment. If detaching yourself from work-related communication on weekday evenings is too big a challenge, then how about the weekend? Choose blocks of time where you cut the cord and go offline. You'll be amazed at how refreshing these breaks are and how they reduce stress by putting a mental recharge into your weekly schedule. If you're worried about the negative repercussions of taking this step, first try doing it at times when you're unlikely to be contacted -- maybe Sunday morning. As you grow more comfortable with it, and as your coworkers begin to accept the time you spend offline, gradually expand the amount of time you spend away from technology. Drinking caffeine triggers the release of adrenaline. Adrenaline is the source of the "fight-or-flight" response, a survival mechanism that forces you to stand up and fight or run for the hills when faced with a threat. The fight-or-flight mechanism sidesteps rational thinking in favor of a faster response. This is great when a bear is chasing you, but not so great when you're responding to a curt email. When caffeine puts your brain and body into this hyper-aroused state of stress, your emotions overrun your behavior. The stress that caffeine creates is far from intermittent, as its long half-life ensures that it takes its sweet time working its way out of your body. I've beaten this one to death over the years and can't say enough about the importance of sleep to increasing your emotional intelligence and managing your stress levels. When you sleep, your brain literally recharges, shuffling through the day's memories and storing or discarding them (which causes dreams), so that you wake up alert and clear-headed. Your self-control, attention, and memory are all reduced when you don't get enough -- or the right kind -- of sleep. Sleep deprivation raises stress hormone levels on its own, even without a stressor present. Stressful projects often make you feel as if you have no time to sleep, but taking the time to get a decent night's sleep is often the one thing keeping you from getting things under control. If this isn't motivation enough to get your stress under control, remember that the ability to manage your emotions and remain calm under pressure has a direct link to your performance. TalentSmart has conducted research with more than a million people, and we've found that 90 percent of top performers are skilled at managing their emotions in times of stress in order to remain calm and in control. This post is part of an editorial series produced by The Huffington Post as part of our monthlong "Work Well" initiative, which focuses on thriving in the workplace. The goal of the series -- which will feature blogs, reported features, videos, and more -- is to present creative solutions you can use to take care of yourself as you take care of business. The effort is also part of The Huffington Post's "What's Working" solutions-oriented journalism initiative. To see all the content in the "Work Well" series, visit here.